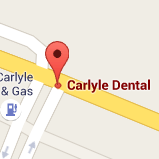 At Carlyle Dental, we provide high quality dentistry in a comfortable, welcoming environment. Dr. Kurt Benning and his staff offer preventive, restorative, and aesthetic dental care for patients of all ages. Dr. Benning uses new technology to diagnose tooth decay, gum disease, oral cancers, and other oral health issues in order to provide better treatments that protect and preserve your teeth. We’re also proud to offer Invisalign® clear aligners, CEREC® single-visit crowns, and Lumineers® veneers. At the office of Dr. Kurt Benning, our goal is to deliver the best dental treatments possible. We want you to experience the benefits of a healthier mouth and a healthier smile. Contact our Carlyle office to schedule an appointment today! Serving Carlyle, Weyburn, and Estevan, SK (Saskatchewan) - Dr. Kurt Benning is your general family dentist offering Invisalign, CEREC, Lumineers, and dental care for children, teens, and adults.